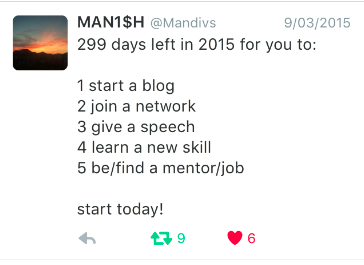 I came across this tweet from @Mandivs back in March and it struck a bit of a chord. 1 to 5 are all things that can help you strive to be a better professional, a better community member and even a better person. While i haven’t managed to complete all of them I have at least set the wheels in motion for just about all of them. I’ve covered off number 1, your’re reading it right now. I’ve joined some networks and contributed to VMware CloudCredibility website as well as providing reviews to ITCentralStation. 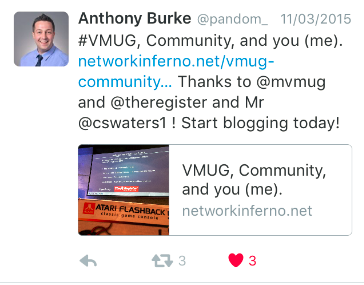 I’ve attended the large annual VMUG in Melbourne and I’m want to give more time to partaking in that community event. At the moment, and with the arrival of our second child back in May, I just don’t have the time to devote to attending the monthly/bi-monthly VMUGs. I’m hoping to be able to carve out more time for that in the next year. For number 3 I don’t really qualify. I’ve completed workshops at work which I’ve lead but there weren’t any speeches. It’s a target for next year though. I’m incredibly self-conscious when it comes to speaking in public so ticking that off the list will be a major achievement for me and put to bed a lot of demons that have been a hangover from my teens. I’ve completed number 4 on numerous occasions this year. Lastly, number 5. While I haven’t found a mentor I’ve tried to be a mentor to others at work and looked to guide them forward. So far it’s mixed reviews but it’s an on-going process. At the start of next year it’ll be a similar list with a few changes but it’s a good goals list to work with again. I admit that I don’t take enough of a part with the local VMware community. I’ve dipped my toe in it but not taken the full plunge. As mentioned above some of this has to do with time but it’s definitely a focus for next year. One person that is always encouraging people to become part of the community and spreading the word is Craig Waters (@cswaters1).Even Anthony Burke above references Craig as being a help. Craig has always been supportive of others taking part in the community and while he’s not the only one that runs the Melbourne VMUG he’s definitely been a powerhouse behind it for the past number of years. So what’s the point of all this? Well, it’s my call to action to say that if i can start, and continue, a blog then anyone can. It just has to become a priority for you and you’ll need to carve out some time to think about, research and write content. Maybe that will mean not watching two episodes of Game of Thrones every night but cutting back to one instead to free up a bit of time. Drastic I know but it’s worth reinvesting your time into yourself. As with everything in life you get out what you put in so pick any of the 5 from @Mandivs list and begin to investigate how you can do them. Even if it’s too late for you to do this year you can add it to some set of new years resolutions. The last thing to say is I concur with @pandom_ above, start blogging today! This entry was posted in Community, VMware and tagged Blog, Career skills, Community, vNotions. Bookmark the permalink.